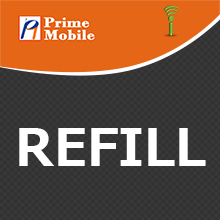 Prime Mobile is the newest prepaid wireless program powered by Omni Prepaid. Plans start as low as $9.99 and offer long distance, roaming, voicemail, and caller ID at no additional cost to subscribers. With the new $15 extra card, users can send and receive text messages, as well as roam off-network for rates as low as $0.14 / min. Note: replenishing an additional plan in the same expiration period will not add more minutes to the current cycle. Rather, the phone will store the additional airtime until the minutes on the current plan are all used. Users must purchase the $15 Extra Card in order to use the text messaging service. Cost per text is $0.14 / min. Domestic Long Distance & Roaming: There are no additional charges for domestic long distance and on-network roaming. Off-network roaming is $0.99 / min. Subscribers must purchase a $15 Extra Card to use this feature. International LD: not available. Nationwide Coverage. See provider for coverage map. N / W: Night time period is 9:00pm - 5:59am Monday - Friday. Weekend period is 9:00pm Friday - 5:59am Monday. - For technical assistance, please call 1-877-2PRIME4.